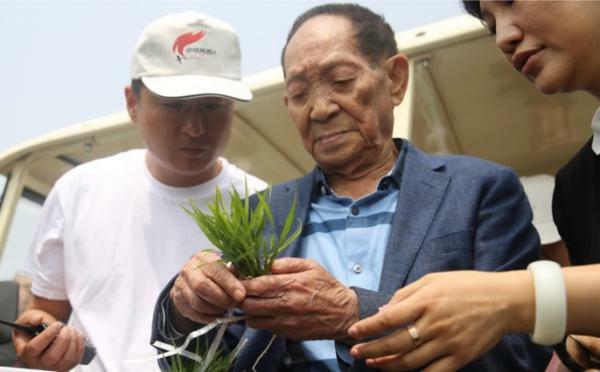 Yuan Longping, the “father of hybrid rice”, will cooperate with Rural Taobao to spread sea rice to a wider audience in an e-commerce poverty alleviation scheme, reported thepaper.com on June 13, based on a message from China’s e-commerce giant Alibaba. The sea rice team has created a road-map of pilot test fields of saline-alkali tolerant rice across six Chinese provinces, said Professor Yuan in June, adding that they’ll work hard to realize a large-scale country-wide plantation in 2020, and lift poor farmers out of poverty. Yuan Longping is attempting to harvest 500 kilograms of hybrid rice per mu (667 square meters), said Jack Ma, founder of Alibaba Group, while the company plans to make the unit yield worth $1,000 with the help of the Internet. Both sides have materialized the spreading of “Yuan rice,” the first cooperative project, and are now ready to co-found research institutes. Saline and alkaline land, a major hindrance to the progress of alleviating poverty in China’s villages, covers a total of 1.5 billion mu (100 million hectares) across the country, mainly in northern China as well as in coastal areas. About 200 million mu of the saline land in China can be used for sea rice plantation, and Yuan Longping’s aim is to introduce hybrid sea rice to about 100 million mu of land within the next three years. Alibaba will integrate the resources to provide aid in standardization, branding, big data, logistics and finance to local produce, said Wang Jianxun, Vice President of Alibaba Group. Wang noted that this cooperation will work as a demonstration in reliving poverty by promoting agriculture, and cover a total of 800 poor counties. Now the hybrid rice project has landed in over 100 counties and provinces such as Henan, Guizhou, Hubei, Sichuan, Hunan and Anhui, benefiting 60 million rural people.